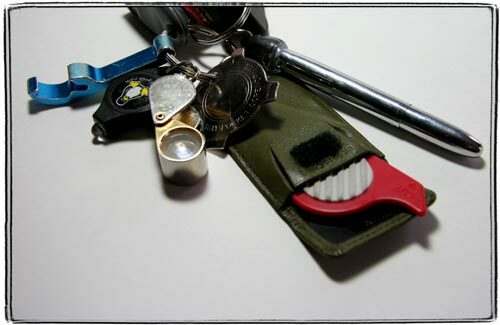 1) Bottle opener. I don’t drink much beer, but a lot of tasty diet drinks sold in NYC bodegas come in non-snap-off cup glass bottles. 3) A 20x 5 element jeweler’s loupe that I bought in a store on 47th street. I don’t get that much use out of it, but it’s petty cool. 4) A Husky brand 4 way pocket screwdriver. 5) A Levenger single sheet cutter. This is one of the most useful little gadgets eve. A tiny ceramic shard on the end of the plastic holder cuts through a single sheet of newspaper. 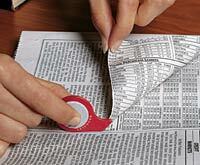 Awesome for clipping newspaper articles, taking out chunks of notes and trimming paper. With a bit more pressure it works on slightly thicker paper, like that in Moleskine notebooks. Also good for taking off cellophane from CDs and trimming gift paper. It’s next to impossible to cut yourself with one. The only gripe is had to notch up the case to make it easy to take the cutter out of it. 6) A Fisher Space Pen epoxied to a little ring. This way I always have a pen to take down notes.